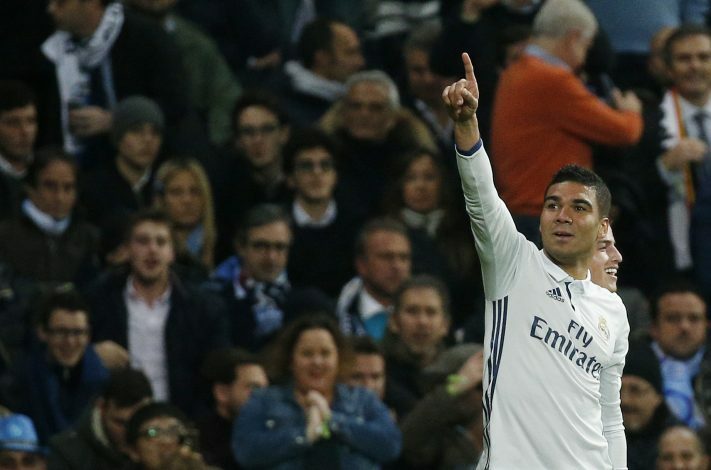 Manchester United boss Jose Mourinho has expressed his interest in signing Casemiro from Real Madrid, according to reports. Casemiro has become a fundamental part of Zinedine Zidane’s squad since the second half of last season, and at present, remains a vital member of the Real Madrid midfield. However, as per reports, the Brazilian feels undervalued due to his current contract with Los Blancos, and apparently wants to move to a club where he feels more valued. Amid the speculation surrounding his future, Premier League duo Chelsea and Manchester United have emerged as interested parties for the midfield man. As per Spanish publication Diario Gol, Blues boss Antonio Conte has already been largely impressed with Casemiro’s work ethic, and will look to lure him to London this summer. However, it remains to be seen whether the Brazil international will agree to the move, given the presence of players similar to his playing style, such as N’Golo Kante and Nemanja Matic, at the Stamford Bridge outfit. Former Chelsea boss Jose Mourinho has also expressed his interest in the 24-year-old, as per Tuttomercatoweb. The Portuguese reportedly believes Casemiro, whose current contract with the Madrid-based powerhouse expires in 2012, to be the perfect midfield partner for Paul Pogba. The current United boss has previously worked with the midfielder for half a season at Real Madrid, which gives him a considerable upper hand over Antonio Conte. Casemiro, who is currently being dubbed as ‘the new Claude Makelele’, recently scored a terrific goal for Real Madrid during their Champions League clash against Napoli, for which he was well praised by Zidane.